Ever wonder who was the first kid to keep a wallet on a big chunky chain, or wear way-too-big pants on purpose? What about the mythical first guy who wore his baseball cap backwards? These are the Innovators, the people on the very cusp of cool. Seventeen-year-old Hunter Braque's job is finding them for the retail market. But when a big-money client disappears, Hunter must use all his cool-hunting talents to find her. Along the way he's drawn into a web of brand-name intrigue-a missing cargo of the coolest shoes he's ever seen, ads for products that don't exist, and a shadowy group dedicated to the downfall of consumerism as we know it. I am a huge fan of Scott Westerfeld. I have loved much of what I have read of his books to date but unfortunately this one didn't live up to my expectations. The story itself was an interesting one which looks at consumerism, the role of media in pushing a brand and all of the many things that makes an item or a look 'cool'. It had the potential to be a really interesting read. The main characters were likable and the idea was really interesting. 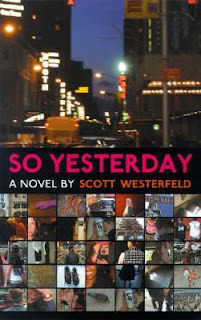 So if you're contemplating a Scott Westerfeld for the first time don't start with this one. Try Uglies instead.